NEW YORK (Bloomberg) -- Dow Chemical Co. is in late-stage talks to merge with DuPont Co. in what would be the largest deal in the chemicals industry, people with knowledge of the matter told Bloomberg. An accord may be announced as soon as this week, said the people, who asked not to be identified because the information is private. After the merger, the company would break into two or three businesses because of regulatory and other issues, the people said. There’s no guarantee a deal will get done and talks may still fall apart, Bloomberg reported. Both companies have a major presence in the automotive supply chain. DuPont's automotive unit ranks No. 64 on the Automotive News list of the top 100 global suppliers with estimated worldwide sales to automakers of $3 billion in 2014. The company produces a variety of polymers, composites, chemicals and bio-based fuels for automakers. Dow Automotive ranks No. 72 on the list, generating $2.8 billion in business with automakers last year. The company produces various adhesives, foams and industrial fluids for automakers. DuPont shares surged 12 percent to close the day at $74.49. Dow shares also rose 12 percent to close at $56.97. The transaction -- with about $130 billion in combined market value as of midday today -- would combine two of the most storied names in U.S. industry and create the world’s second-biggest chemical company behind BASF SE as well as the largest seed and pesticide company, surpassing Monsanto Co. Representatives of both companies declined to comment. The Wall Street Journal reported the merger talks earlier on Tuesday. This year has already been a tumultuous one for DuPont, whose former CEO Ellen Kullman stepped down in October, about five months after winning a proxy battle waged by an activist investor. Dow CEO Andrew Liveris led the company’s recovery from near-insolvency during the financial crisis and has faced pressure from an activist shareholder -- Dan Loeb’s Third Point. 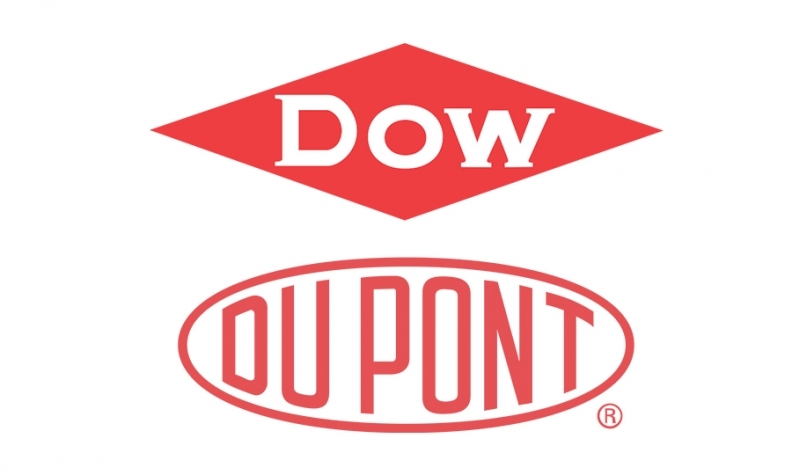 DuPont and Dow, which have market capitalizations of $58.4 billion and $59 billion respectively, have in recent months confirmed they were weighing options for their agricultural-chemicals businesses, both of which supply genetically modified seeds. There’s been widespread speculation about potential deals in that industry as lower crop prices curb farmer spending, and after Monsanto’s bid for Syngenta AG, which was withdrawn in August. Monsanto CEO Hugh Grant said last month that “everybody has been talking to everybody” in the industry. The split following a Dow-DuPont merger would probably involve creating a company focused on agricultural products such as crop seeds and pesticides, another focused on specialty chemicals and a third that makes plastics and other commodities, said Hassan Ahmed, a New York-based analyst at Alembic Global Advisors. Each would find cost savings in the combination and have improved scale, he said. Total cost savings would amount to $3 billion, CNBC cited unidentified people familiar with the deal as saying. Any antitrust issues could be overcome with modest divestitures, according to Ahmed. The Wall Street Journal reported that Dow’s Liveris is expected to be executive chairman of the merged company while DuPont CEO Ed Breen would retain that title. Making Breen CEO would fit well with his strength in breaking up companies, as he did at Tyco International Ltd., Ahmed said.